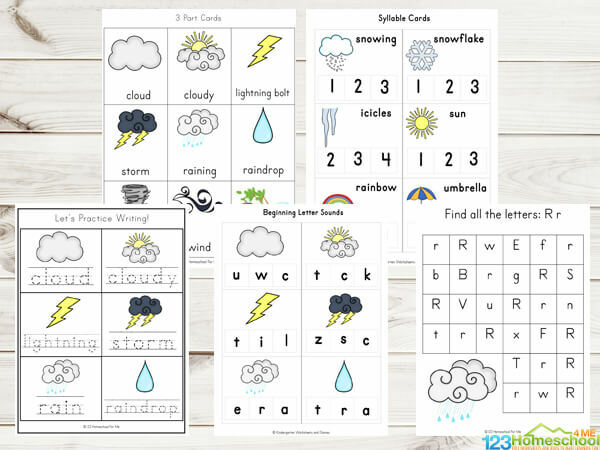 Learning about the weather is fun and exciting with this Weather Printable Pack . 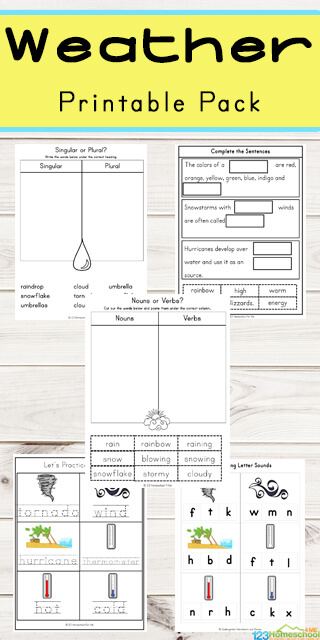 Children will love learning about tornadoes, hurricanes, storms, lightning and the wind with this 60+ page Weather Printable Pack that is aimed at children in kindergarten, preschool and grade 1. 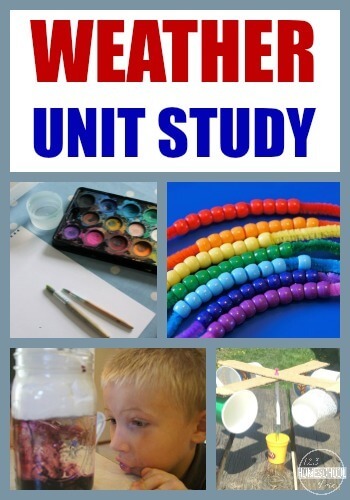 This Weather pack contains over 60 pages and is a great way to introduce children to different weather conditions. Inside this pack, you’ll find many different math and literacy activities, handwriting practice, puzzles, and much more! 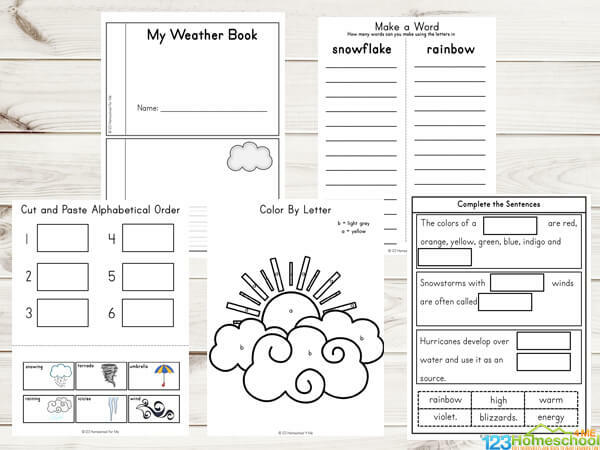 Included in this printable pack is a book for children to research the different weather conditions and write a short sentence about each one in their own words. 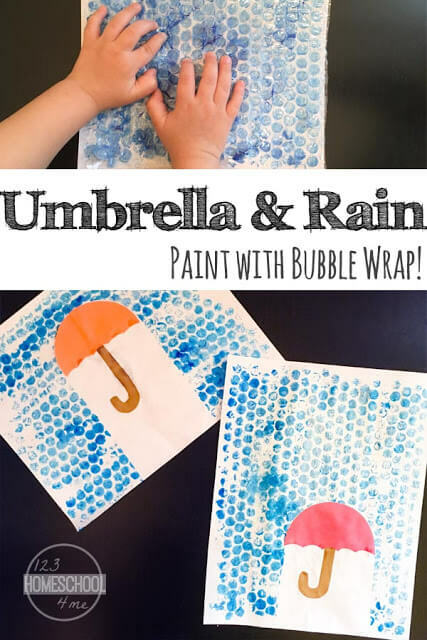 There are also many other math and literacy activities that will need supplies such as paperclips or pegs, a highlighter, crayons or coloring pencils and scissors. This pack is very easy to prepare with most of it including no-prep activities. •Alphabet Puzzle Cards – Cut out, laminate and use to match the lower case letters to the uppercase ones. •Trace the Words – Improve handwriting skills while learning to spell. •3 Part Cards – Can be used to match the words to the picture or in games such as memory. These cards can also be used together with the alphabet cards. using the alphabet cards to spell out the words. •I Spy – Count the objects. •Beginning Letter Sounds – Cut out, laminate and use a peg or paperclip to clip or place a pom pom or candy onto the correct answer. •Syllable Cards – Cut out, laminate and use a peg or paperclip to clip or place a pom pom or candy onto the correct answer. •Find the Letters – Shade in the squares or use a dot marker or bingo marker to dot out all of the correct letters. •Writing Pages – Create your own story using the pictures. •My Booklet – Write a sentence or two about each object. •Complete the Sentences – Cut and paste to complete the sentences. •Singular or Plural? – Write the words in the correct column. •Word Search – Find all the words. •Noun or Verb? – Cut and paste the words into the correct column. •Color by Letter – Color the pictures using the code. •I See – Count the pictures and write the number. 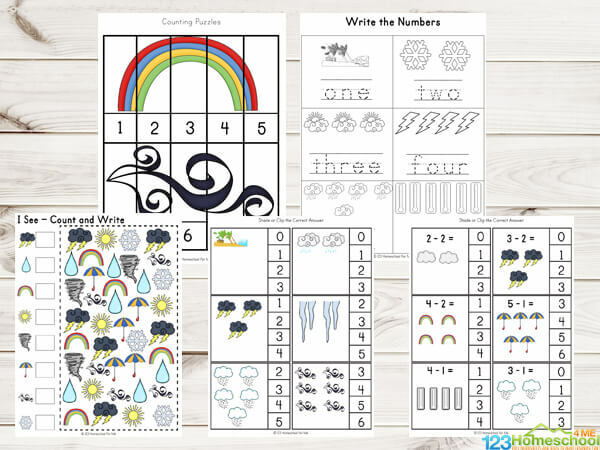 •Counting Puzzles – Cut out, laminate and use the numbers to place the puzzles back together. •Counting Cards – Shade the correct answer or cut out, laminate and use a peg or paperclip to clip or place a pom pom or candy onto the correct answer. •Addition Cards – Shade the answer or cut out, laminate and use a peg or paperclip to clip or place a pom pom or candy onto the correct answer. •Subtraction Cards – Shade the answer or cut out, laminate and use a peg or paperclip to clip or place a pom pom or candy onto the correct answer. •I can Tell the Time – Shade in the correct answer or cut out, laminate and use a peg or paperclip to clip or place a pom pom or candy onto the correct answer. •More or Less – Read the instructions and write the correct numbers. •Coloring Activity – Roll a dice and then color the picture in the correct color. •Let’s Graph – Print out the pictures on white cardstock and then cut them out. Place them face down on a table and pick up one and graph. •Write the Numbers –Write the numbers from one to twelve. •Write and trace the Shapes – Trace the shapes and write their name. •Color by Number – Color in the pictures using the correct code.